Imagine this: You wake up Monday morning feeling refreshed. You had a great night of rest, and walk into the office with a smile on your face, ready to take on the day. Suddenly, your co-worker comments on how exhausted you look… even though you had a full night’s sleep? Banish those annoying, embarrassing situations forever! The skin around your eyes is delicate and thin. It requires extra attention, and care. To reduce the appearance of dark circles and puffy eyes, you need a skin care product that keeps your eyes looking as energetic and youthful as you feel. More importantly, you need a healthy solution free of oils, harsh chemicals and parabens. You Need THAT Eye Cream™! What I was real impressed with was how after a few applications, the area under my eyes looked brighter and the dark circles seemed to decrease. I will definitely be buying more when this bottle runs out. This eye cream is not greasy at all, but light and quickly absorbed. It feels very refreshing and does not sting at all like some other facial products I have used. A little goes a long way. My skin around my eyes looks and feels great! I have used it for about a month and can definitely notice a difference! Smells great and doesn’t leave an oily residue! 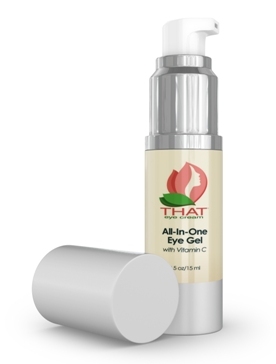 Women everywhere hail THAT Eye Cream™ as one of the top eye creams for puffiness , dark circles, and healthier skin. And for good reason – 3 good reasons, actually! It’s the great dilemma when it comes to beauty products. You want to use safe, high-quality products so that your skin absorbs only the healthiest ingredients. At the same time, you want a solution that works effectively to relieve your puffy eyes and dark circles. THAT Eye Cream™ is the perfect marriage of these two desires. Free of parabens and oils, THAT Eye Cream™ uses only the safest and most effective ingredients. Better yet, the results are on par with the other expensive, chemical ridden eye creams on the market. With THAT Eye Cream™, you get bright, beautiful eyes without the toxic overload. Your doctor advises you to take your vitamins on a daily basis. But did you know that your skin needs the same nourishment from essential vitamins too? Your skin is one giant organ. What you apply topically gets absorbed into your skin to help boost its vitality, health, and appearance. With THAT Eye Cream™, your skin gets a healthy dose of vitamin C with each application. Dermatologists back up the claims that using vitamins on your skin will help prevent premature aging. Vitamin C in particular is ideal for firming and brightening your skin. 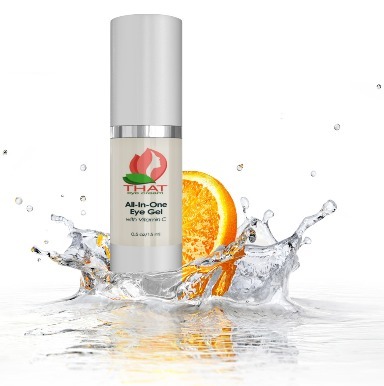 With this potent antioxidant, you build collagen, clarify your complexion, and brighten your skin tone – all with a completely natural ingredient! Ultimately, you want to feel your best in your own skin. Your looks have a serious impact on your life. From your career and relationship successes to your overall happiness, your looks and confidence play a big role in how others perceive you. THAT Eye Cream™ is designed to eliminate unattractive signs of aging that make you squirm when you look in the mirror or meet someone for the first time. Puffy eyes, stubborn dark circles, sagging skin, wrinkles, crow’s feet, and more appear to diminish, allowing your bright inner beauty to shine through! Unlike heavy solutions that leave you feeling greasy and grimy all day, THAT Eye Cream™ is oil-free and absorbs quickly. It goes on smooth and won’t interfere with your eye makeup or irritate your eyes. With your bottle of THAT Eye Cream™, you’re only 3 easy steps away from brighter, more radiant eyes. Apply this safe, gentle formula twice a day, or every time you wash your face. A little bit goes a long way. With one pump, you will nourish your skin and reduce signs of aging. THAT Eye Cream™ is light and refreshing. With just a few dabs around your eyes, you’ll be all set to go. Layer it with other moisturizers (perfect for people with dry skin), or use it alone! Either way, your skin gets the anti-aging benefits you demand, without unnatural, harsh ingredients jeopardizing the health of your skin. Your ageless beauty depends on the products you put on your skin. With THAT Eye Cream™, younger looking eyes are just the beginning! Give it a try and see for yourself how refreshed you will feel with brighter, younger looking eyes. Copyright © 2013-2016 THAT Eye Cream™ and Radiant Health Naturals. All Rights Reserved.